Description: KCS "Belle" late in the afternoon at Union Station. Description: The KCS F-units, the Christmas train, and the cars for the executive train. 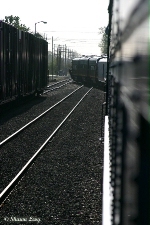 Description: KCS "Belles" arriving for the 2007 RailFest, straight from the paint shop in Mexico. Locomotives have just brought the M-LZJA stack train to Jackson and are running light to Meridian. Yes, they are going away from the camera as indicated by the green signal ahead of them. Description: KCS "F" units arriving for 2007 RailFest, just past Okatibee Creek bridge. Description: Right after being parked at the Union Station platform for the next days RailFest. Description: KCS & NS units pose for a night shot in front of the Meridian station. Description: NS & KCS F-units pose in front of the Meridian transportation terminal. 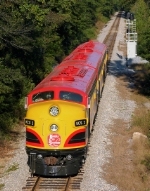 Description: KCS Retro Belle F-Units on display in Meridian for Railfest. Description: KCS F-Units wait outside the yard office in Meridian. Description: Close up of KCS 3 "Pittsburg".